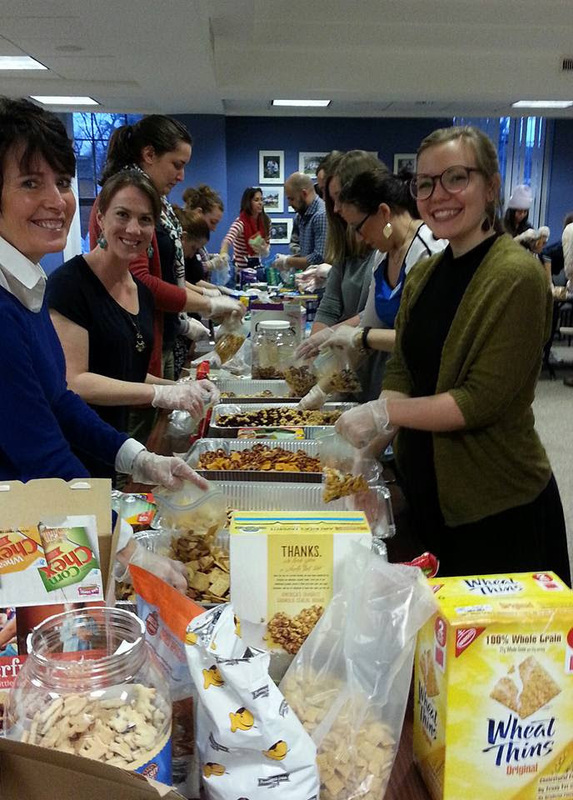 Third Annual Send Hunger Packing was Our Biggest Yet! | B Team Buffalo Inc.
B Team Buffalo Inc. > Blog > Send Hunger Packing > Third Annual Send Hunger Packing was Our Biggest Yet! Third Annual Send Hunger Packing was Our Biggest Yet! Thank you to all of the volunteers who came out on a rainy Dyngus Day this past March 28th to help out with Send Hunger Packing! Over 400 small bags of trail mix were put together this year. In addition, volunteers helped to sort toiletries into boxes and packed bags of feminine hygiene products for homeless women. Three carloads were dropped off at the Harbor House Drop-In Center! You can see photos on our Facebook page. Feel free to tag yourself. Special thanks goes out to our sponsors and partners,Senator Timothy Kennedy, Target on Walden, BJ’s Wholesale Club on Sheridan, United Way of Buffalo and Erie County, AmeriCorps Alums of Buffalo, and Planned Parenthood of Central and Western New York for making this event so successful. Please support them if you have the chance.